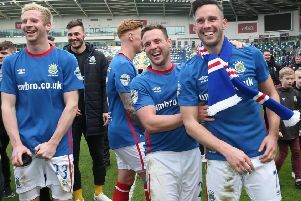 Linfield will face Celtic in the Champions League IF they overcome SP La Fiorita in the first qualifying round. David Healy’s side were the last pairing drawn in this morning’s draw and will host their opponents from San Marino on either June 27th or 28th with the return leg on July 4th or 5th. But in the draw for the second qualifying round the Blues were drawn with Brendan Rodgers side in what is a real mouth-watering tie. In the Eurpoa League Coleraine and Ballymena United will both take on Norwegian opposition in the first qualifying round. The Bannsiders will face FK Haugesund with the Sky Blues taking on Odds BK. Crusaders will be up against Latvian opposition in the form of FK Liepāja. Meanwhile, Derry City will be off to Denmark on their travels after they were paired with FC Midtjylland. Ties to be played on 29 June and 6 July. In the second round draw Coleraine would take on the winners of Lech Poznan or FK Pelsiter if they get through, with Crusaders facing either Shakhtyor Soligorsk or FK Suduva, Ballymena would face either Bala Town or FC Vaduz and Derry City would take on the winners of Ferencvaros or FK Velgava. Ties played on 13 and 20 July.